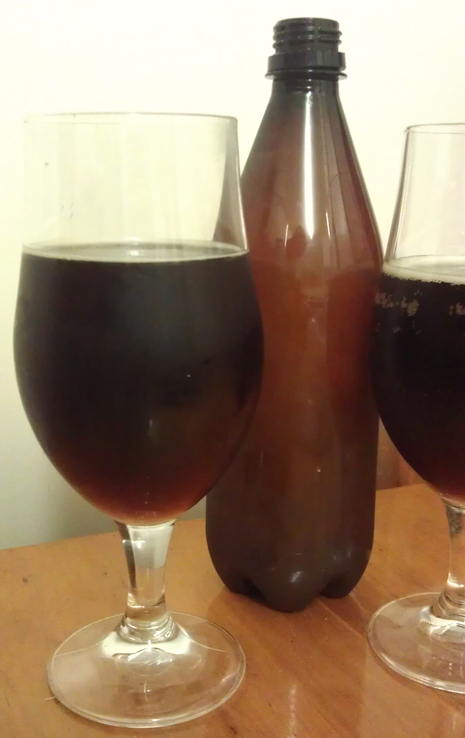 Way back earlier this year I helped out someone make some home brew. I got a bottle of it a few weeks later. It’s been in the fridge for months. And now I’ve tried it. This was a beer I made with my wife’s boss. We were away for a weekend at their holiday home. Plus we made a kit beer. I was able to provide some really good advice to speed things up and get better results. It was a fun couple hours. The beer is a kit called Dark American Ale and comes from Brewcraft/Liquorcraft. Ingredients included cans of liquid malt and some steeping grains. Nothing too complex. And looks like it turned out well. The aroma is a nice hint of sweetness and slight dark nutty malt. A slight hint if burnt caramel. Exactly what you would expect. It’s a good set up for a beer of this style. First taste has the dark malt come out. Next follows a bit of dark caramel sweetness. Finally the hop bitterness at the back. For something that’s ‘just’ a kit, there’s plenty of mouth feel. Lots of flavour at the start and middle. The flavour isn’t thick, but you’re not expecting or wanting that here. While the beer does get thin the flavour doesn’t completely drop off. That said the hops at the end take over, with the malt only just holding it all together. The only real downside us a slight metallic taste. It comes at the back, and lasts long after the beer. It’s a drawback on a nice beer which is a real downer. Food wise, this could work with a stew meat thing. Maybe a casserole or think sauce meat pie, something gutsy and rich. I like the flavours at the start. Good and balanced. The finish really let’s it down. Overall nice but not great.